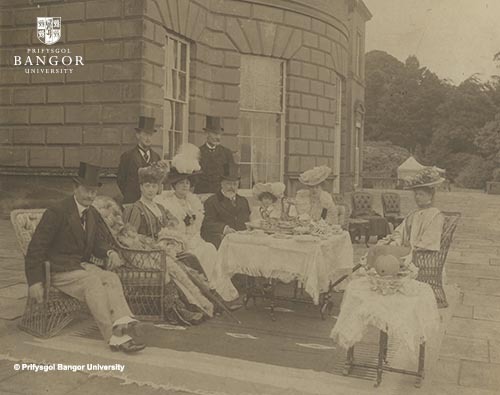 Photograph of “The Royal Party on the Terrace at Baron Hill, Beaumaris” taken on the 9th of July 1907. Back row (left to right): H.R. Hughes (Kinmel) and Lord Tweedmouth. Front row: (left to right) Sir R. Bulkeley Bart., H.M. the Queen, Lady Magdalen Bulkeley, H.M. King Edward VII, Miss Siriol Bulkeley, H.R.H. Princess Victoria and the Countess of Gosford. On the same day, the King also attended the laying of the foundation stone ceremony at the University College of North Wales in Bangor. This photograph was purchased recently at a local auction by Mrs Mary Simpson of Newborough, a friend of the Archives and Special Collections. She was eager that a copy of this photograph should be added to our collections, since the Baron Hill papers are held by the University and because of the historical royal connection with the founding of Bangor University.